For 15 years my husband and I lived in a beach house outside of Pattaya. The porch had a huge bougainvillea that wound its way up the side of the house. Our cat would climb up each morning and spend the day sleeping in the shady part of the roof. Upon our return from work in the evening, she would make her way to the edge and peer down at us. 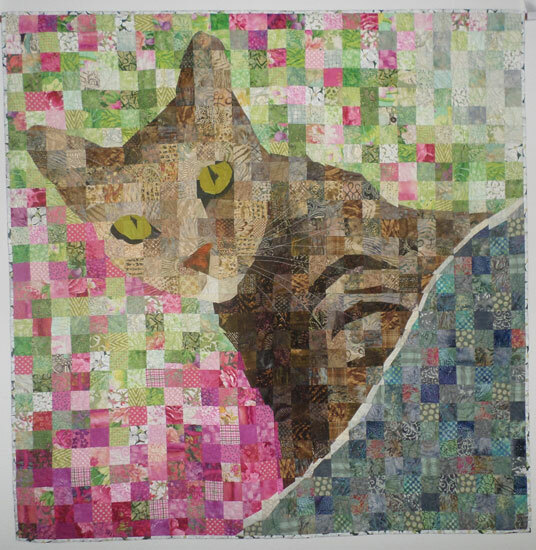 When I decided to do a quilt of our cat, this picture was an obvious choice.